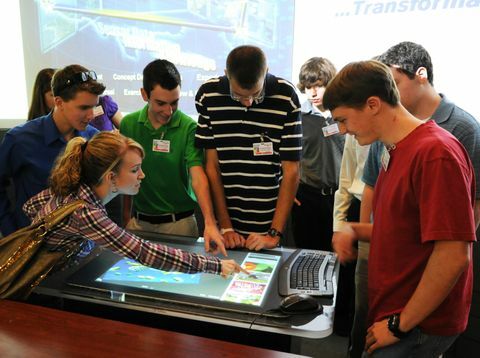 MELBOURNE, Fla., Jan. 20, 2010 -- This week 29 Brevard County high school students kicked off a semester-long NextGen Engineers seminar sponsored by Northrop Grumman Corporation's (NYSE:NOC) Aerospace Systems sector. The NextGen Engineers program is aimed at exciting high school students about careers in Science, Technology, Engineering and Mathematics (STEM). This six-month program will focus on a different engineering discipline each month and is designed to introduce students to the engineering field, stimulate interest in advanced technologies and design. It will also provide an opportunity to gain practical knowledge through hands-on activities and to work with Northrop Grumman mentors. "This is a tremendous opportunity for the students and our company," said Tom Vice, sector vice president, Battle Management and Engagement Systems Division. "The objective of NextGen Engineers is to excite these talented students about a future career in engineering, and possibly with Northrop Grumman. Involving students in STEM activities is critical for the future of our country. We need to do everything we can to attract talented individuals to technical careers. We're looking forward to a very successful program." The students were tapped from among the best and brightest of the top performers in Brevard County's public and private high schools. The group's average GPA is 4.0 and ranges from freshmen to seniors from ten area schools. Northrop Grumman's Melbourne facility is the home to the U.S. Air Force's E-8C Joint Surveillance Target Attack Radar System (Joint STARS) development and total system support programs. The E-8C, which has flown more than 60,000 combat hours in support of overseas operations, is the world's most advanced wide-area airborne ground-surveillance, targeting and battle-management system. It detects, locates, classifies, tracks, and targets hostile ground movements, communicating real-time information through secure data links with joint and component command and control elements.